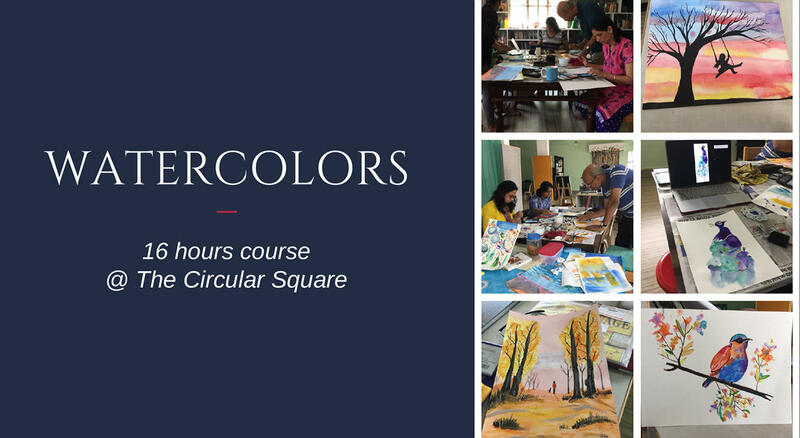 This is a 16 hours course that will introduce you to the mediums of Watercolors and the techniques required for using watercolors for painting landscape, still life and perspective. Participants can opt for any 16 hours within the given course schedule. learn about the colour wheel and how to mix colours to get the desired effect to make your painting look more vibrant. You will also learn about light and shadow and how that translates into a realistic painting.Based on this knowledge, you will replicate a landscape photograph into a landscape painting and get a better grasp of the water colour medium. - Still life painting (5 hours): There will be an introduction to still life observation and painting techniques. You will learn the techniques and differences between painting a landscape and a still life object using water colors, and paint a still life setup from observation. - Perspective painting (5 hours) - There will be an introduction to concepts of one-point and two-point perspective which will then be applied through observation. You will draw and paint a perspective from life. You will apply the water color techniques learnt in previous classes to create a final perspective painting. All material required for classes will be provided. Ujwala Vishwanath is a cinematographer, sketcher, painter, photographer and sculptor. She has completed her Bachelor of Fine Arts from Indiana University US, PG-Diploma in Multi-Media Broadcasting in Journalism from the World Media Academy & ICFJ, and Master of Fine Arts from American Film Institute Los Angeles. Having 8 years of experience in sketching, painting, cinematography, photography and sculpting, she works with documentary filmmakers, Discovery communications, Meditech and Sudhee networks, being just a few of them. She also works as a freelance cinematographer for films as well as conducts workshops and classes for those wanting to express themselves through art.